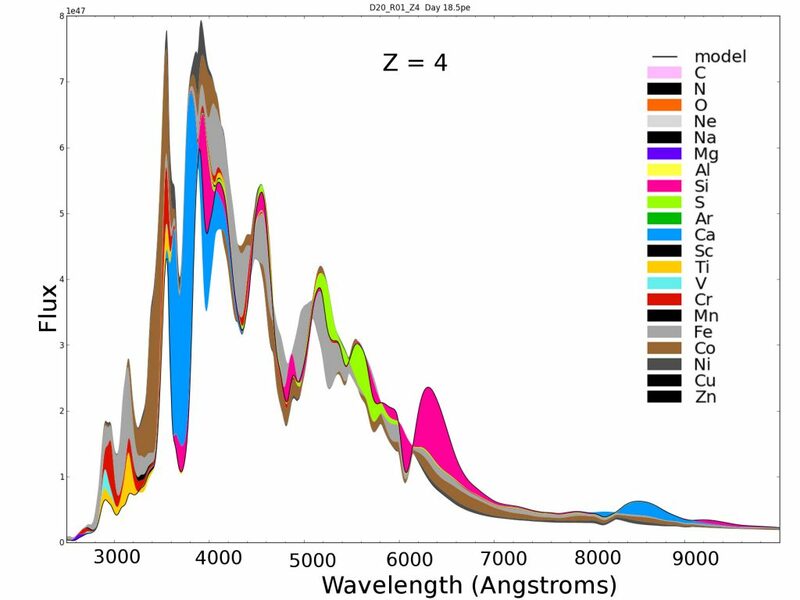 Simulated visual light spectrum of a supernova. Colors indicate how each element changes the spectrum and show how the effects of various elements overlap each other. Computation by UA faculty member Dean Townsley and collaborators. Thank you for your interest in graduate astronomy at The University of Alabama. Our group includes seven astronomy faculty members as well as adjunct faculty and graduate students. All our faculty members are involved in both teaching and research, with research interests ranging from stars to galaxies, clusters of galaxies, and quasars. For more details, see the list of our faculty and their research interests. Graduate students in the astronomy program within the department take courses in physics as well as astronomy, ensuring the broad background necessary to understand and participate in modern astronomical research. The University of Alabama Department of Physics and Astronomy offers programs of study leading to MS and PhD degrees in physics specializing in extragalactic astronomy and astrophysics. Students in our department have ample opportunity for interaction with students and faculty outside of class. Besides Wednesday Research Colloquia by departmental and visiting faculty, astronomy students and faculty meet on Friday afternoons during the semester to hear and give talks on research in astronomy. As a public service, students and faculty also give popular talks and host observing sessions at the University Observatory. Get answers to your questions about our graduate programs by contacting the graduate director, Dr. Dean Townsley. Visit our Resources for Grad Students page for links pertaining to admissions, courses, degree requirements, and more.